At the turn of the seventeenth century, when Priest Antonio Neri was employed in Florence by the Medici prince Don Antonio, he worked closely with another alchemist by the name of Agnolo della Casa. Casa chronicled Neri's work and after his colleague's death in 1614, he undertook a special mission for Don Antonio to interview Neri's other associates and uncover the priest's recipe for the philosopher's stone. Don Antonio went as far as consulting a medium in Venice to contact Neri in the afterlife, but that is a story for another time. 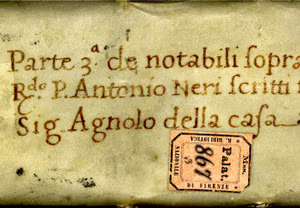 Thousands of pages of notes relating to Antonio Neri's work in Florence were recorded by fellow alchemist Agnolo della Casa. A significant portion of this nineteen-volume transcript is devoted to Neri's work on transmutation and specifically on the fabled philosopher's stone. The trouble is that he wrote much of it in obscure language, which renders it among the most cryptic in the entire canon of alchemy. Other sections of Della Casa's notebooks contain copies of the works of various adepts including Geber, Ramon Llull and Arnold Villanova. Neri took a keen interest in all of them. In 1597, Prince Don Antonio de' Medici occupied the dormant Casino di San Marco and made it his new home. His father, the former grand duke, built this combination palace and laboratory on the north side of the city to indulge his own fascination with natural secrets. Don Antonio began to assemble a team that included Neri and Della Casa. The three men were all about the same age, in their early twenties, ready to do great things; ready to reveal nature and change the world. In their time, it was reasonable to think that one metal could be 'purified' into another and that a single medicine could cure all disease or counteract any poison. These notions had been around since ancient times. In this realm, a skeptical eye was an absolute necessity, but there was no specific evidence that disproved the old stories. Don Antonio reportedly spent a fortune collecting recipes and testing them; he and his men worked to separate the real from the bogus. Swindlers and con men were in plentiful supply; they hawked miracle cures in public squares throughout Europe. Without a firm grasp of the underlying chemistry, the task of understanding a particular compound or chemical reaction could be quite difficult. Even to experienced, careful researchers, there was no guarantee that conclusions were correct. Don Antonio was convinced that the glassmaking priest had indeed discovered the secret of transmutation. He put Della Casa to work interviewing Neri's acquaintances to see what could be learned. An expert gold refiner, Guido Antonio Milani, reported to Della Casa that in July 1596, Neri had performed before his eyes a transmutation of base metal into "twenty-four carat" gold. He said he pressed the 20-year-old, who in reluctance, confided that he had learned the secret from a German, who performed the gold transmutation with a "tablet of medicine." The German told Neri the medicine was nothing but the simple quintessence of green vitriol and the method to produce it was described by Paracelsus. * This post first appeared here in a shorter form on 2 Sept 2013.